SQL Server Integration Services (SSIS) is part of the Microsoft suite of SQL Server Business Intelligence tools or BI Tools. Integration Services is Microsoft’s Enterprise grade tool for the extraction, transformation and loading (or ETL) of data. It is designed to handle the migration and manipulation of data throughout the life cycle of a BI application, and is a critical part of moving data into data warehouses that are used in BI. 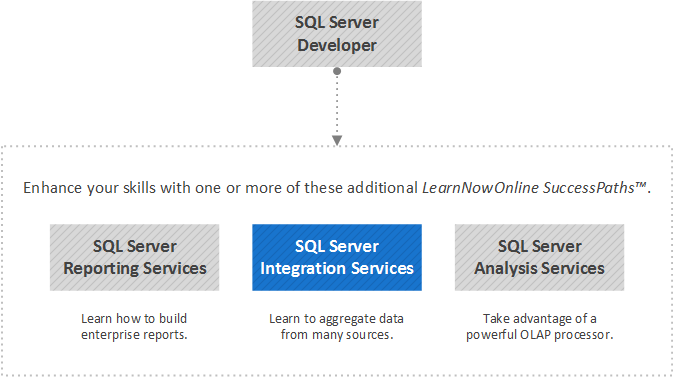 In this path you will learn about the SSIS architecture, including two of the main ways to create packages—the import and export wizards—as well as how to build them from scratch using SQL Server Data Tools. Each integration package contains a single logical control flow that can be as simple or complex as you need. You will learn about the Flow Control and how it manages tasks within the SSIS package, including basics like the SQL task, file system task, FTP task, and email task. Then you will explore some of the more complex tasks like the transformation task and the data flow task which allow you to manipulate and transform data. To ensure data integrity, you will learn how to create containers and build transactions. Finally, you will learn about the power of variables and expression to implement complex business logic by providing more granular control within SSIS packages.